Podcast of messages he preaches. A blog on which Dalton shares his thoughts and reflections. A new page for connecting youth with a Youth Blog page. A page call Spiritual Checkup. One feature is a link for presenting the Gospel via the internet. Dr. Michael Cook will become the director of graduate ministries at Huntington University on June 1. This is a key position in the training of new ministers. Cook currently chairs the Christian Ministries Department at Taylor University Fort Wayne, where he has served for the last 12 years. He developed the Bachelor of Science degree in counseling program at TUFW and a number of new courses. Before TUFW, Cook taught at New Orleans Baptist Theological Seminary. Cook served as the counseling pastor at First Missionary Church in Fort Wayne for four years and has worked in other churches and counseling centers as a clinic director, staff counselor, research consultant, youth pastor, and associate pastor. Cook holds a Ph.D. and Master of Divinity degree from New Orleans Baptist Theological Seminary as well as a Bachelor of Arts degree from Albany State University in Georgia. As director of graduate ministries, Cook will oversee all the graduate ministries programs as well as the Diploma in Christian Ministries, and teach courses in these programs. He will work closely with the other graduate program directors and relevant denominational committees. I am reading a new book, God’s War on Terror, written by Walid Shoebat (Executive Media). Walid is a converted Muslim. Technically the book, in my opinion, is not edited very well, but as far as getting the point across, it is power-packed. He believes that the nations that God goes to war against in the end time are all Muslim nations. His arguments are pretty convincing. The book has 98 chapters and 490 pages. So you can see there are a lot of short chapters. This is not devotional reading, but I think it is worth the read. Has anyone else out there read it? If so,I would be interested in your take! Michigan has been hit particularly hard by the economic crisis. At Banner of Christ church (Byron Center, Mich.), 15 families have been affected by layoffs or job cuts. Several men who are key breadwinners had been at the same location 25-30 years. Many of them got good jobs right out of high school or college. This is the first time they’ve been in this situation, and they know they could be unemployed for a long time. It’s not like they can make five phone calls and line up interviews for next week. We decided to bring together people who had lost their jobs. We scheduled the meeting from 6-8 p.m., and we provided pizza. Twelve of the 15 families at Banner directly affected by layoffs or job cuts were represented–both husband and wife in some cases, just one spouse in others. After eating, we held an informal time of sharing–what work they had been doing, their skills and abilities, what they might do if they can’t return to their previous work. Then we committed to praying for each other and keeping alert for job opportunities we could share with each other. One guy doing a job search might come across an opening which fit someone else’s skillset. They were still taking about 8:00 when I basically said, “Last one out, turn off the lights.” Four men stayed for another 45 minutes, just sharing and networking. They committed to meeting monthly to check in with each other, and in between meetings, we used a confidential group email list. At least two families that aren’t part of Banner are in that email group. I was blown away. It brought the magnitude of it to me–the number of people being affected by job cuts, and how much comfort they found in meeting to pray and share. We have now seen two guys get at least part time work. Two guys also set up times every week to volunteer doing stuff for and around the church–just a way to give something back. 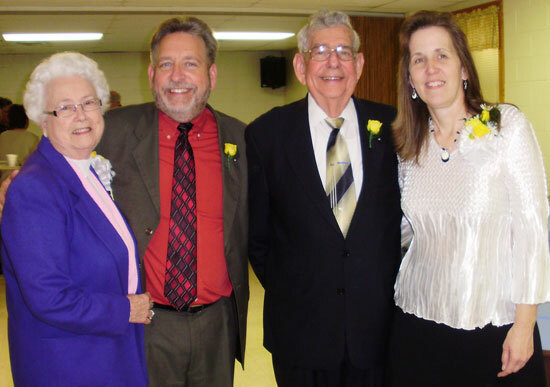 Top: Pastor Denny and Annette Sites with Denny’s parents, Bishop Emeritus Wilber and Mossie Sites. Bottom: Jerusalem Chapel Church. On Sunday, March 29, the congregation of Jerusalem Chapel (Churchville, Va.) honored Pastor Denny and Annette Sites, who have now served the church for 25 years. The celebration included musical favorites of Pastor Denny, and a video of the Sites family covering the past 25 years. A gift was presented from the congregation. When Denny came here 25 years ago, 38 people attended his first service. Today we average 400. 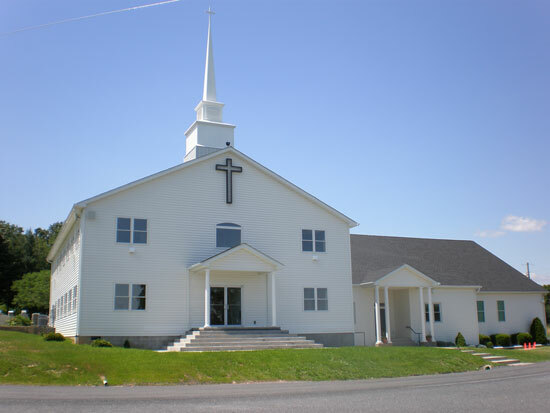 Under his ministry we added a sanctuary seating 300 and a fellowship hall. We held two services in the chapel until the current building was constructed, at which point we went back to one service. But a few years later, we had to go back to two services. A few years ago, a fire destroyed the 125-seat chapel that was over 100 years old. That was a sad day for many in the congregation, but now an educational building stands where the chapel once stood. We don’t always understand why things happen, but the Lord had bigger and better things in store for us. The Lord has truly blessed us under Pastor Denny’s ministry. We are also blessed to have Associate Pastor Matt Hann and his wife, Emily; and Youth Pastor Todd Yoder and his wife, Amy. We thank the Lord for the staff he has given us and for what He has done for us as we look forward to the future. 27 Apr Easter Story: Hillsdale, Mich.
Lester Smith, Senior Pastor, Hillsdale, UB, Hillsdale, Mich.
Holy week proved to be a real “It’s Friday, but Sunday’s coming” experience for Hillsdale UB Church. Three of our families lost five loved ones during the week. Our congregation and community were rocked by an automobile accident which claimed the lives of a young mother and two of her children. Her sister is a member of the church. The driver of the other car also is from our congregation and required surgery for an injury from the accident. A couple who are leaders in the church had their house burn down the same day as the tragic accident. Other church members ended up in hospitals in Jackson, Hillsdale, Ann Arbor and Toledo. In one sense the HUB congregation experienced a “Good Friday” week filled with pain, sorrow, and death. But Resurrection Day reminded us of the hope of the empty tomb and new life in a very profound way. Our attendance was up 20% from last year with over 700 in our three services. After our early service, a single mom and first-time attender received eternal life. The final service was an Easter musical called, “I’ve seen Jesus.” This was also the name of the theme song which ended the service. In the middle of that song at 12:16 pm, Parker Falke was born. His parents are members of the HUB. The baby’s mother was rushed to the hospital emergency room on Maundy Thursday, because she was several weeks short of her delivery date. So Easter Sunday brought to the HUB new life, one spiritual and one physical. Great Attendance Easter Sunday of 156. To give the greatest proof of the resurrection during the presentation of the sermon, the retired chief of police, who recently came to our congregation, gave his testimony of conversion. It was powerful since all knew his position as the former chief. 24 Apr Easter Story: Huntington, Ind. We had a great service where the Lord was honored. As a result, there were three conversions. After the service, two of the three came forward to receive their brand new New Believers Bible. I received a note from a wife this morning sharing with me what wonderful decision this was for her husband and coming forward was giant step. The Holy Spirit was at work and we are once again humbled. The First Lady of Sierra Leone came through on the promised help from the Nigerian Embassy (High Commision). The Nigerians recently did an on-site visit and will be sending us 1 doctor and 2 midwives with a possible aaditional doctor in the near future. The hospital is responsible for providing accommodation and things like fridge, stove etc. for the house. They are supposed to come the first week in May. We are going to temporarily lodge them in the guest house used by the Medical Team whilst we work on getting Baker house ready. This will be a tremendous boost for the hospital. This past week, Mrs. Sia Nyama Koroma, the First Lady of Sierra Leone, attended (with the vice president’s wife) the USA Doctors Summit in Los Angeles. They also met with Rick and Kay Warren at Saddleback Church. 23 Apr Easter Story: Kokomo, Ind. On Good Friday, we did something we had never done before: we hosted an absolutley FREE meal for our community! We realized times are tough and wanted to do something special to demonstrate God’s love to the people. We had hoped to serve 3000-4000 meals, but with the help of over 100 volunteers, we served approximately 5300 FREE chicken and noodle meals! We offered dine-in, carry-out, and delivery to those who weren’t able to come! It was an incredible experience! We’ve heard so many wonderful stories from people who were touched by something as simple as a free meal! God is so good!